I’m waging a valiant, but losing battle against the demons of distraction—those self-centered brain sprites who care not a whit that I have a writing deadline to meet today. I will NOT go online, I say to them, I’m writing! At least, I would be if you’d just hush. I look across the room and notice the sprites have lured my muse away with a quart of jamoca fudge ice cream. Useless ditz. Usually I keep her close with a box of chocolate chip cookies. I couldn’t get her attention now if I piped in chocolate direct from Pennsylvania. . .but that makes me think of—oh, what’s that place we used to go to for that incredible chocolate Easter candy? I’ll just search it really quick. Criminy! Who knew there were so many chocolatiers in Pennsylvania? Oh, my, that one has tours; and this one is right across the border. How far is that from Woodbridge? My muse is now in a jamoca fudge stupor, dancing around the room like a wood nymph while the sprites clap with delight. She’s oblivious to the cascade of ideas trailing behind her, tumbling across the floor like dry leaves in the breeze and disappearing behind the furniture. Hey, those were MY ideas, I shout. Pull yourself together! I race to save a precious few but they seem to disintegrate the moment they’re out of sight. Speaking of leaves, did anyone from the north east notice that the ends of nearly all the trees are blighted with dead leaves? I did, and yep, I looked it up. See here, it says that’s called flagging. Those are the last traces of our recent cicada visit. The trees will be fine next spring. Dash it! That was a 30-minute detour. And while we’re at it, I absolutely abhor the sound of sprite giggle. She can’t help herself; she twirls by to see where I’m going with it. Quick as a wink, I lasso her with a noun string and tie her to the chair beside me. She rolls her eyes, or perhaps she’s trying to focus. She starts patting her now-empty pockets and looks up all wide-eyed and innocent, but I have no sympathy for her fudge-faced self. I hold my hand out, palm up, and give her my sternest no-nonsense look. I can’t write about writer’s block, I sputter. What kind of idea is that? But my question goes unanswered; my muse is now slumped over and snoring with abandon. It’s pointless to wake her. She’s going to hate herself in the morning. And so I do. Take THAT, my muse-less salad spinner. So, the verdict is out. George Zimmerman has been deemed “Not Guilty” of second-degree murder or manslaughter. This is not to say he is innocent of any wrongdoing. However, the nation will never know the entire story of what happened to Trayvon Martin. More importantly, his family will never really know, because the real victim in this trial was the truth. This entire saga has been railroaded by media and political interference. Would it have made a difference if you knew the 911 operator had asked him to describe the individual’s skin color, and then asked what he was wearing? Of course it would have. But those questions were edited out of the transcripts. (“Never let facts get in the way of a good story” seems to be the media mantra). In fact, many media outlets did everything possible to make Zimmerman look guilty. To add drama, they even called him a “White Hispanic man”…has the media ever called our president a White Black man? Fortunately for Mr. Zimmerman, he had a fair trial in light of the available evidence. Had the media or politics not intervened, he might have been tried on different charges—charges that could have been proven. If any good can come of this, it would be that we can learn from it, and hopefully, next time allow the law officials to do their jobs. This can also serve as a wake-up call for those of us who could do a little more thinking for ourselves and stop swallowing everything the media tries to force down our throats. I’ve long believed we as a nation are only too eager to accept what we hear on the news as truth, and that it’s damaging our country and our relationships. Stop listening to hate-mongers and start doing your homework! You and I have the power to share peace and light with the world, regardless of the anger and darkness around us, just by choosing to do so. Which brings me to another reason this case hits home for me. It offers a perfect segue for announcing the book I’m working on right now that is of surprising coincidence, only it isn’t. It is a true story about a man named Joe, who, in the ‘70s, was tried and actually convicted of a crime he did not commit. His case was also affected by media and personal ambitions. But that’s where the similarities end. The real story is not about the case against Joe as much as it is about the way he handled it—not with hate and bitterness, but with peace and light. As a result, lives were made better, for both family members and fellow inmates, and now he says it was the best thing that ever happened to him. If you want to follow our progress, watch “Joe’s Story” on my website. In the meantime, wake up, America! I’ll say it…God Bless America! I’m celebrating everything that made us the nation we are today…warts and all. We are still the greatest nation, and we are still under God, though I fear we’re rapidly turning from Him as a teenager rebels from his parents. 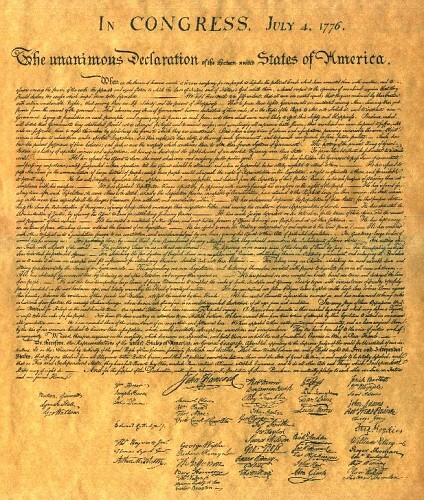 I implore you all to take out your copy of the Declaration of Independence (or search the internet for a copy if you don’t have it framed and on the dining room wall where it belongs). Read it. Cut through the flowery language—get an interpreter if you have to. Consider where we’d be today if it weren’t for a few incredibly brave, insightful, godly men who understood what it would take for this nation to prosper, and who knew that it wasn’t a king we needed, but a government that protected our rights instead of usurped them. Think of what went into creating this Declaration, and the Constitution that followed. No other nation’s founding documents can compare. Americans have fought and died for those words since the day they were written. This is, indeed, a day for celebration. I still believe we can turn this nation around again, through prayer and integrity, because I believe in the goodness of the American people and in the merciful hand of a loving God who is patiently waiting for us to grow out of our teenage years and return to Him. So I toast (imaginary clinking goes here) to our freedom, the courage of our forefathers, and the opportunities that lie ahead for this nation. May God bless America! I’m flying home from Florida, after a weekend spent talking with a charming man named Joe and his sweet wife Audrey, regarding a book we’re working on together (details soon, I promise). Across the aisle from me in the plane’s overhead bin, is a large cardboard box filled with folders of notes, letters, and newspaper clippings that Joe entrusted to me. I can’t see it while we’re in flight, but there’s a small strip of tape peeking out from the base of the bin, and I know that’s the box. It is the only evidence I have that I’m not dreaming. I steal occasional glances to make sure it’s really there, and each time my heart skips—is this joy or fear? Perhaps a bit of both. So, when she held one out to me I was eager to see how my persona had been captured in a corny maxim. It would no doubt highlight my sense of humor, or incredible imagination. Sadly, I was to be disappointed. Mine was the worst. It made no sense and wasn’t one bit amusing. It said, “Today is the first day of the rest of your life.” What rubbish! What was she trying to say about me? I snatched it up and disappeared into my room. I’m sure I threw it away, but I never forgot the incident, and those words clattered around in my brain for years. Where do we start, and where will it take us? Regrettably, I usually don’t hang around long enough for an answer, which is why I’m often adrift and without purpose. But today, I know without a doubt what we’re going to do. And tomorrow, and just about every day after that for the next few months. We’re going to empty that box. We’re going to read, and learn, and type. We’re going to open doors, capture emotions, and light a fire in the darkness. We’re going to write! Oh, Mom, I wish you were still here so I could thank you. How did you know? Mine was the best bookmark of all!